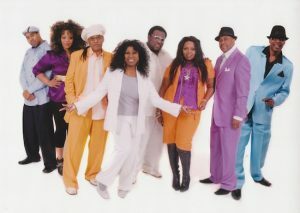 The Atlanta, GA-borne band was started in 1977, when keyboardist/vocalist Jason Bryant, saxophonists Billy Ellis and Willie “Sonny” Killebrew, guitarist Bruno Speight, bassist John Alexander Simpson, drummer James Earl Jones III, and lead vocalist Mary Davis formed a group called Santa Monica that played at Atlanta nightclub the Regal Room. Their manager, Bunny Jackson-Ransom sent a demo to Clarence Avant, head of Tabu Records. After signing the band to Tabu, Avant suggested that the band work with songwriter/producer Sigidi Abdullah. Abdullah was curious as to why an Atlanta-based band named itself Santa Monica. Keyboardist Jason Bryant replied that the band had an enjoyable concert in Santa Monica, CA. Abdullah then came up with a new band name, The S.O.S. Band, with S.O.S. standing for “Sounds of Success”. Abdullah produced and co-wrote “Take Your Time (Do It Right)” with Harold Clayton, which went platinum, parking at number one R&B for five weeks and peaking at number three pop on Billboard’s charts in spring 1980. The debut LP, S.O.S., went gold, selling over 800,000 copies and holding the number two R&B spot for three weeks. While the band was on its world tour, trumpeter/vocalist/percussionist Abdul Ra’oof joined them. Their second album, Too, went to number 30 R&B in summer 1981. On the band’s third LP, S.O.S. Band III, they worked with producer Leon Sylvers III and writers Jimmy Jam and Terry Lewis. The breaking single, “High Hopes,” hit number 25 R&B in the fall of 1982 while the album went to number 27 R&B in late 1982. On their fourth LP, On the Rise, Jam and Lewis took over the production duties scoring with the slammin’ number two hit “Just Be Good to Me” and the number five beatbox ballad “Tell Me if You Still Care”. On the Rise became their second gold album hitting number seven R&B in summer 1983. The formula continued working: Just the Way You Like It (including the number six R&B single “Just the Way You Like It”) went to number six R&B in fall 1984 and Sands of Time (including the number two R&B hit “The Finest”) went gold and hit number four R&B in spring 1986. Many of these releases as well as the sound of early releases helped to popularize the now-classic sound of Roland drum machine the TR-808. In late 1986, vocalist Mary Davis left The S.O.S. Band to pursue a solo career. In 1987 the band contributed a song called “It’s Time To Move” to the Police Academy 4: Citizens on Patrol soundtrack. The band released their seventh album in 1989. For Diamonds in the Raw the lead vocalists were Chandra Currelley and Fredi Grace and three producers were used (Curtis Williams, Eban Kelly & Jimi Randolph, Jason Bryant & Sigidi). Saxophonist, and one of the founder members, Billy Ellis died during the recording of the album. The album reached number 43 on the R&B chart. One of Many Nights with lead vocalist Chandra Currelley and produced by Curtis Williams followed in 1991. It failed to chart. In August 1994, former lead vocalist Mary Davis reunited with Abdul Ra’oof and together they reconstructed a new band with the same funky S.O.S. sound, appearing on comedian Sinbad’s HBO concert specials and Rhino’s various-artists set United We Funk issued October 5, 1999.